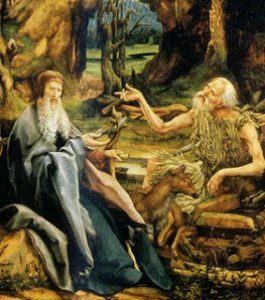 The early Christian phenomenon known as the “Desert Fathers” is of interest outside the theological domain. Commonly misunderstood, and also still widely neglected, this subject will not be unlocked by the contemporary indifference to “monks,” a category fitting very different psychologies and lifestyles. The earliest Christian monks did not resemble the medieval varieties, especially those in European countries. 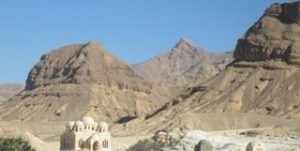 The Desert Fathers, basically meaning Coptic (and Greek) ascetics of Graeco-Roman Egypt, were frequently anchorites in the early phase, retreating from the persecutions inflicted by the Roman regime. A major ideological influence was Origen (entry no. 45), active at Alexandria in the early third century CE. Some (or perhaps many) ascetics similarly came from an urban background, likewise possessing a strong degree of literacy. The Greek word monachos later became the standardised description for all types of monk, including many destitute peasants during the fourth century, when the monasteries proliferated in Egypt. By that time, earlier figures were becoming legendised, especially Antony, the subject of a hagiography composed by the bishop Athanasius. “The legacy at hand for anyone who like Antony, at the turn [end] of the third century, retreated from the duties of social life for the life of a philosopher, was not what, half a century later, a bishop like Athanasius wanted his flock to be fed with” (Rubenson, The Letters, p. 125). The distinction is vital between what came before and what followed after. The subsequent phase was increasingly manipulated by the Christian clerics, who sought to outlaw Origenism and other teachings which became maligned as heresies. Athanasius (c. 298-373) was a major factor in the trend to orthodoxy. This bishop of Alexandria sought to create a unified Egyptian church within the Roman Empire, making the monks subservient to his scheme of organisation and doctrine. The simplified concepts attending “monasticism” became a vehicle of episcopal mandate. The earliest anchorite on record is Paul of Thebes, an obscure figure who fled to the desert from the Decian persecution (249-51 CE). A legendary meeting between Paul and Antony occurred in the Eastern desert of Egypt, as related by Jerome (d.419), a Latin-speaking scholar who favoured the monastic lifestyle. 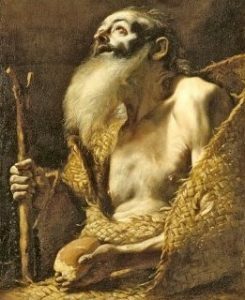 Standard conceptions and beliefs about the early hermits derived from the pious milieu of a later era, in the hagiological literature developing from the mid-fourth century. This corpus was extensively edited during the fifth and sixth centuries, and has to be regarded with caution. The lives (vitae) and sayings (apophthegmata) of revered “desert fathers” reflect preoccupations of later writers. In the latter half of the fourth century, numerous places in Egypt were the scene of ascetic activity. Many hermits favoured the desert cells of Nitria and Scetis in the Delta region, not far south of Alexandria. Their lifestyle is often classified as semi-anchoritic, as they were not completely cut off in solitude. The early ideal was that of cells at a sufficient distance apart to enable total privacy; the hermits assembled on Saturday and Sunday to share a meal, some travelling three or four miles to the rendezvous church. Over the generations, a standard form of mud-brick hermitage developed, accommodating up to three monks. Bread and salt was the staple diet, alleviated by pilgrim visitors who supplied gifts of more exotic food, including honey, fruits, and wine. There was no fixed monastic rule amongst the hermits; wine was discouraged by the elders. A widespread recourse was that of weaving mats, ropes, and baskets from halfa grass or palm fibre, these items being sold in the towns. The Greek word monasterion originally designated the hermit cell; only at a later period did this term apply to a collective monastery. The cell varied in appearance, but with the passing of time, frequently comprised two rooms: an ante-room for manual activity such as rope-weaving, and a rear room for prayer and sleep. It is evident that quite a large number of the early Egyptian solitary monks lived a surprisingly practical existence, not at all resembling the medieval European models of monasticism. Ideas about ascetic extremism are wide of the mark, and certainly on an aggregate basis, it would seem. Egyptian (or Coptic and Greek) asceticism was mild by comparison with the Syrian Christian version of the anchoritic life. The desert fathers tended to disapprove of severe austerities. “Although evidence of excessive mortification can be found in Egypt, it nonetheless was an exception rather than the rule, and was usually practised most often in terms of food deprivation” (quote from Jeffrey Conrad, Egyptian and Syrian Asceticism, online PDF). The sayings of the fathers are preserved in numerous collections, and in different languages varying from Latin and Greek to Arabic. These utterances have often been regarded as authentic fourth century records. However, strong doubt applies on this point. “There is every reason to suspect theological and ecclesiastical tendencies at work in the sifting and transmission of the material over more than a hundred years. Thus the overall picture given in the sayings, even if only the earliest stratum is used, reflects the way the leading monastic circles wanted their forerunners to be remembered” (Rubenson, The Letters, p. 39). The complexity of these trends as a whole is reflected in the fact that urban, village, and desert environments were all represented in early Egyptian monasticism. In this respect, the phrase “desert fathers” can be misleading. The Athanasian hagiography of Antony stressed the desert milieu, which the clerical version preferred. “The city and village ascetics continued in their role, but their place in history was lost” (Goehring, Ascetics, Society, and the Desert, p. 88). Athanasius resorted to the phrase “a city in the desert,” supposedly created by Antony. In reality, most of the ascetics seem to have resided near inhabited sites. The desert myth has been interpreted as the contraction of a multi-faceted trend which the clerics wished to monopolise and control. A relative minority of the Egyptian ascetics really did move into the desert, and at a substantial distance from towns and villages, walking as much as three days or more before stopping at a cave or other location. In an atmosphere of dogmatic manipulation, Athanasius wrote his Life of Antony at circa 360. The subject had recently died, and was now presented as a model of orthodoxy. The bishop’s alleged contact with Antony is strongly in question. His involvement in the Arian controversy was a doctrinal incitement to enlist the monks in his (anti-Arian) clerical cause. “Athanasius tried to involve the monks more fully in the public life of the Church by appointing many of them as bishops; he also asserted the right of bishops to intervene in monastic affairs” (Brakke, Athanasius and the Politics of Asceticism, p. 12). This was the death-knell of vintage monasticism. Origenist and other teachings were crucified in the ritualist cause of sacraments enforced by the clergy. The conventional life of Antony (d. 356) exhibits clerical strictures and superficial lore, including the extravagant Athanasian demonology. Factual occurrences are slender. Seven formerly relegated letters of Antony are now considered to be a more reliable guide, serving to cast light upon what he really taught. “The obvious dependence on popular Platonic philosophy and Alexandrian theological tradition reveals that the author was no ‘ignorant monk’ who had simply exchanged the garb of the peasant for the monastic habit, but a teacher who wore a monk’s garment as if it was the robe of a philosopher” (Rubenson, The Letters, p. 11). In his allegorical exegesis, Antony has been revealed as a follower of Origen. Antony’s sense of inward reflection exhorted his associates to “know thyself,” a spiritual essence being the subject of contemplation. This was far removed from the extroverted activities of the ritualist clerics, who were fixated on sacraments, pomp, and revenue. By the time of the Council of Nicaea in 325 CE, there were already 72 bishoprics in Egypt. “The Church, through donations of money, grain, valuable articles, animals, slaves, and above all of land, rapidly accumulated considerable wealth…. Apparently, the office of the bishop was soon regarded as so attractive that people tried to become bishops in order to enrich themselves” (ibid., p. 107). Antony was born in Middle (or Lower) Egypt, and is also associated with Mount Kolzim, near the Red Sea, where he reputedly lived in a cave. To the south, in the Thebaid, a strongly contrasting form of monasticism emerged, being communal (coenobitic) rather than anchoritic. The coenobitic model eventually became the standard for Christian monasticism, a situation in which the earlier hermit life was eclipsed. The reputed founder of the coenobitic lifestyle was Pakhom (292-346), whose career also became legendary. Born a pagan Copt, he was baptised as a Christian. Pakhom initially lived as an anchorite on the banks of the Nile, being the disciple of an obscure hermit named Palamon. At the deserted village of Tabennesis, Pakhom established a community of monks, which eventually harboured a hundred inmates. His community flourished, and by the time of his death, there were nine monasteries under his direction. Manual labour was a strong feature of the coenobitic lifestyle. “Most Pachomian monks were Coptic speaking peasants, but several brothers clearly belonged to the Graeco-Roman elite” (Elm, Virgins of God, p. 289). There were also two Pachomian monasteries for nuns, many inmates being the sisters, wives, mothers, and daughters of the monks. The discipline became codified into a formal Rule, committed to writing at an uncertain date. There are strong indications that Pakhom resisted clerical interference, avoiding ordination. In his monasteries, ordination was regarded as a source of pride and jealousy. The ego inflation caused by clerical status was despised. In 345, a disapproving episcopal synod placed Pakhom on trial at Latopolis; he escaped during a riot. After his death, the practice of appointing monks to bishoprics became widespread by the fifth century. The Pachomian communities adapted to clerical orthodoxy. A rival grouping was eclipsed by episcopal strategies. The Melitian schism produced a separate church in Egypt, primarily Coptic, which found supporters amongst Coptic ascetics. The Melitian monasticism was “mainly located in or very close to villages and towns” (Elm, Virgins of God, p. 345), and like the Pachomian model, was engaged in agricultural work and trade. The Melitian church also evolved a clerical hierarchy by 334 CE; they were effectively rivals to Athanasius, who regarded them as heretics. Complexities in events included the participation of women, meaning the Christian virgins who appeared in the third century, particularly at Alexandria. They were noted for religious study; this trend attracted literate young women from a wealthy background. A modern scholarly description for this development is “academic Christianity.” Bishop Athanasius resisted innovations, wishing to impose clerical authority upon the monastic movement. “Athanasius’ effort to separate virgins from the discourse of academic Christianity thus involved intensive censorship of the virgin’s speech and hearing” (Brakke, Athanasius and the Politics of Asceticism, p. 72). The clerical manipulators maintained their cordon in subsequent generations. Bishop Augustine enlisted the support of Jerome against the dissident Pelagius (entry no. 47), who was ousted from the scene as a heretic. Pelagius is associated with the monastic movement; he was not encumbered by the clerical appetite for ritual and predestination dogma. Bibliography: David Brakke, Athanasius and the Politics of Asceticism (Oxford University Press, 1995); Brakke, Demons and the Making of the Monk: Spiritual Combat in Early Christianity (Harvard University Press, 2006); Douglas Burton-Christie, The Word in the Desert (Oxford University Press, 1993); Susanna Elm, Virgins of God: The Making of Asceticism in Late Antiquity (Oxford University Press, 1994); James E. Goehring, The Letter of Ammon and Pachomian Monasticism (Berlin: Gruyter, 1986); Goehring, Ascetics, Society, and the Desert: Studies in Early Egyptian Monasticism (Trinity Press, 1999); William Harmless, Desert Christians (Oxford University Press, 2004); Philip Rousseau, Pachomius: The Making of a Community in Fourth Century Egypt (University of California Press, 1985); Samuel Rubenson, The Letters of St. Antony (Minneapolis: Fortress Press, 1995). Copyright © 2012 Kevin R. D. Shepherd. All Rights Reserved.